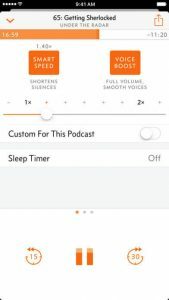 Download podcasts over cellular, set a sleep timer, or use Voice Boost to enhance and normalize speech volume. Adjust playback speed, and use Smart Speed to pick up extra speed without distorting the conversation. Overcast is ad-supported. If you choose to purchase Overcast Premium to remove ads, payment will be charged to your iTunes account, and your account will be charged for renewal 24 hours prior to the end of the current period. Auto-renewal may be turned off at any time by going to your settings in the iTunes Store after purchase. Current price for the Season Pass is $9.99 USD per year, and may vary from country to country. The good – initial loading of my 20+ subscribed podcasts was quick and easy. Set the first playing in the playlist and it plays through until you hit stop or it runs out. I like having a running playlist of all of the current unplayed or partially played episodes, that I can quickly drag and prioritize my new dailies before my weeklies. Feature wishes – prioritize new podcasts like the playlist; automatic subscription loading from default podcast app; a new type of discovery service – perhaps curated or within current categories – give me 5 or 10 minute chunks of the top 5 podcasts, or give me the top rated / top streamed pod? episode? from the top 5 channels within a category … something that gives me enough to preview, but isn’t oppressive – add a subscribe now button to the GUI and I’m set; separate video podcast section to really blow through my gigs. Out of all the podcast players I’ve tried (there have been a lot! ), this one is the most user friendly. I am an avid podcast listener and am subscribed to at least 50. Overcast accommodates all of them, even if the memory on my phone doesn’t! There are only a few complaints: the title page of each podcast may have a description but the app doesn’t allow you to see the entire text. Unlike other apps though, it does allow you to read the details of each episode, unlike some of the others I’ve tried. Another non-feature that drives me nuts is if you back out of the screen your podcast is playing, you can’t go back to that podcast; instead you have to scroll through them all again, e.g., if I am listening to Casefile and want to look at descriptions of other podcasts, I can’t just go back to the Casefile podcast. I have to return to the top and scroll back down the list to find Casefile again. I have to admit, that’s the most annoying non-feature I’ve discovered so far. Other than that, the sound is great, you can build a playlist and the forward/backward buttons are adjustable. If Overcast could fix these two little gripes I have, it could take over the podcast world!! *deep, maniacal laugh*. Seriously, if you’re looking for a convenient podcast player, this is it. Happy listening.